The Tameside Pledges 2016 are a commitment to deliver work on a number of priority areas that have been identified as being of importance to Tameside residents. Each of the Tameside Pledges is delivered through a bespoke programme of activity centring around areas that local residents tell us are important to them, such as supporting local business, cleaning up local grot spots and the improvement of recycling facilities. Lots More Lighting – We will continue the roll out of super-efficient LED street lighting to cut running costs and our carbon footprint. 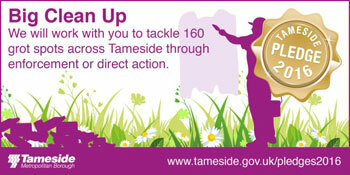 Big Clean Up – We will work with you to tackle 160 grot spots across Tameside through enforcement or direct action. Get Tameside Growing – We will work with the community to get Tameside growing its own food in window boxes, gardens, community spaces and allotments. Keeping it Green – We will improve recycling of non-domestic refuse with recycling bins in town centres and Council offices. 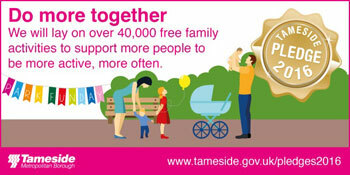 Refresh Tameside Works First – We will buy services and goods from local providers as much as possible. Generation Savers – We will open a credit union with £10 for each 11 year old starting secondary school in September. Every Child a Coder – We will facilitate coding clubs for primary school children, run by college students, to give our young people the skills they need for the twenty first century economy. Get Connected – We will rollout free WiFi across each of our town centres. Silver Surfers – We will combat digital exclusion by offering a range of computer skills workshops and classes for those who want to get connected but lack the skills to do so. Mind Your Health – We will sign the mental health ‘time to change’ pledge and support national events promoting good mental wellbeing. Dementia Friendly Tameside – We will increase the number of dementia friends and dementia champions to make Tameside a dementia friendly Borough. Do more Together – We will lay on over 40,000 free family activities to support more people to be more active more often.